Yukon Gear & Axle high performance ring & pinions set the standard for quality. Yukon Engineers use state-of-the art design & testing processes, backed by 2 in-house quality labs to ensure each item manufactured meets exacting specifications & quality standards. 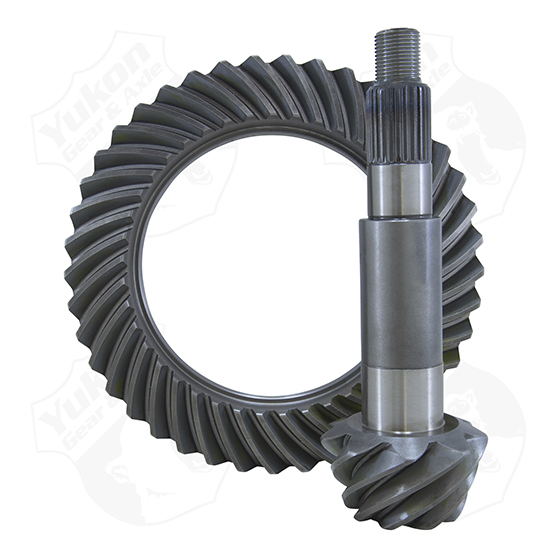 Yukon designed gear tooth surface finish reduces both friction & heat for long races & high torque conditions. We use high grade steel in both the ring & pinion, with fitment designed to OEM specs. Go ahead, add loads of horsepower & go big on tires because Yukon offers the widest selection of gear ratios to choose from. You’ll know that your gear choice was the right one, because you chose Yukon. Yukon Ring & Pinions come with a 1 year warranty against manufacture defects. Yukon offers a Y.E.S. Plan for a lifetime, comprehensive, no-questions-asked protection plan covering your gears for as long as you own the vehicle.